How many people in Scotland want rid of Trident? the majority wants Trident out. To ‘fess up straight away I was wrong about 59%, the true figure is 53%, but that’s still a majority. I gave a link to the correct data online (it’s set out in detail below) and the full source is the excellent Scottish Social Attitudes Survey. HIM: no you attempted to manipulate data to substantiate your opinion. HIM: is that correct? yes or no? ME: I can’t explain further but I do have a reasonable understanding of statistics. Good night. So without the constraints of 140 characters per message of Twitter who’s right, ‘him’ or ‘me’? 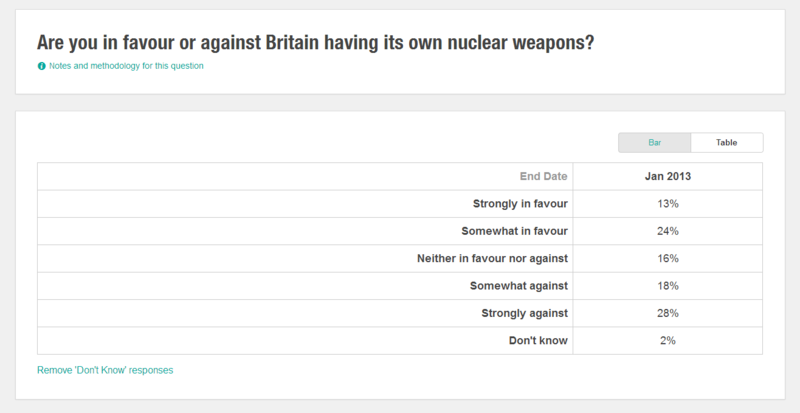 The first thing to say is the question asks whether Britain should have nuclear weapons, not Trident specifically. But since Trident missiles are the only nuclear weapons Britain possesses it’s a reasonable approximation. It should also be noted that the Scottish Social Attitudes Survey is a reputable, reliable and statistically valid source of opinion on the subject matter it covers. I know of no other up to date neutral source that addresses the same issue. In any event, the statement originally made was that ‘the majority wants Trident out’, not ‘the majority excluding “don’t knows” and those “neither in favour nor against” want Trident out’ – as the other person concerned amended his claim to when challenged. These are two quite different things. To put it another way, if you lined up 100 Scots and said ‘Will everyone who is somewhat or strongly against Britain having nuclear weapons please step forward?’ 46 would. That’s a minority. This sort of detail is important because it’s the only way to tease out the claims and counter-claims that accompany the independence referendum debate. Incidentally, the question of Scotland being different from the rest of the UK features prominently in ‘Yes’ claims about the independence referendum. It is interesting to compare the results of the same question asked in the Scottish Social Attitudes Survey’s sister survey south of the border (the small percentages of ‘Don’t know’s have been excluded from this table). The differences in the level of support are not that large, and both parts of the UK could reasonably be described as being divided on the subject (the full report can be downloaded here). 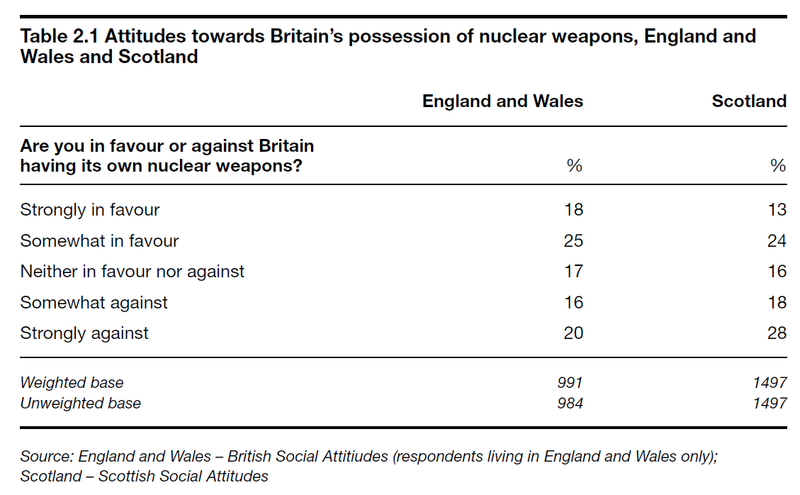 To go back to the original issue, I maintain that there is not a proven majority of people in Scotland who ‘want Trident out.’ But I’m open to reasoned arguments that prove the opposite.